Composting « Global Market Insights, Inc. Solid waste management industry, over the last few years, has been witnessing a tremendous growth in terms of remuneration, owing to the fact that the developed and developing nations across the globe are increasingly framing stringent regulatory norms and guidelines to tackle the burgeoning environmental challenges pertaining to solid waste. Furthermore, various regulators and government agencies have been making concerted efforts to assist the leading and upcoming solid waste management market players, to ensure appropriate collection, segregation, transportation, storage, disposal, and recycling of rapidly increasing waste volumes across the world. The U.S. Environmental Protection Agency (EPA) for instance, has emerged as one such regulatory agency to have left a significant influence on the overall solid waste management market. The agency has recently permitted Enerkem to construct a first of its kind municipal waste-to-cellulosic ethanol plant under the U.S. Renewable Fuels Standard (RFS). The agency has further granted USD 3.5 million to the Canadian cleantech firm building the project, to accelerate the facility’s completion in time. It would be prudent to mention that the facility would have a massive capacity to process 100,000 tonnes municipal solid waste, which would be utilized to generate 40 million liters of fuel-grade cellulosic ethanol. Citing yet another instance, the EPA has recently approved the nation’s first mechanical biological treatment (MBT) municipal solid waste-to-solid recovered fuel (SRF) facility worth USD 19 million to be built by Entsorga West Virgina, LLC, a joint venture between Chemtex Global N.V, Entsorga Italia, and Apple Valley Waste Technologies, Inc. For the record, SRF would be utilized by large energy consumers as a clean-burning alternative over environment-degrading fossil fuels. Apparently, more such moves are anticipated in the immediate future which would, in turn, charting out lucrative growth avenues for solid waste management market size expansion. According to a few trusted research reports, the global solid waste management market was estimated to have held a total valuation in excess of USD 240 billion in 2016. Speaking in terms of regional growth outlook, the European solid waste management market is set to grow at an exponential pace in the years ahead. The ever-increasing inclination toward adopting recycling technologies in the European nations such as UK and Germany, coupled with the introduction of comprehensive directives by government agencies to lower air pollution and land usage shall stimulate the growth potential of solid waste management market. As per reliable estimates, UK solid waste management industry size is predicted to surpass a total processing capacity of over 35 million tonnes by 2024, the reason being the previous record of the UK having recycled 64 % of its packaging waste in 2014. Concurrently, in the recent times, the region has been characterized by new waste-to-energy (WTE) facilities being set-up by leading solid waste management industry giants. Hitachi Zosen Inova AG, a Swiss firm part of Japan’s Hitachi Zosen Corporation, for instance, has recently announced its plan to build Turkey’s first WTE plant for processing municipal solid waste to generate electricity to the tune of 70 MW. The facility is touted to be the largest WTE project in Europe which would have the capacity to process around 15% of Istanbul’s solid waste per year and is scheduled to start operations in 2021 with three incineration lines. 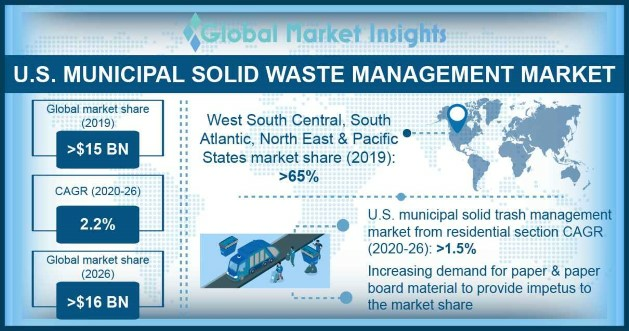 In addition, it is noteworthy to mention that the foremost firms partaking in solid waste management market including Biffa Group Ltd, Hitachi, Veolia, Amec Foster Wheeler, E.L. Harvey & Sons, Stericycle among others have been focusing on acquiring upcoming companies to fortify their presence in this industry. The UK-based waste management company, Biffa Group Ltd, for instance, has concluded five acquisitions in the previous financial year. The firm has continued its acquisition spree further by buying out the waste management operations of O’Brien Waste Recycling Solutions Holdings Limited for an estimated 35 million Euros. Meanwhile, many more such mergers and acquisitions are anticipated to materialize in the ensuing years. Apparently, driven by such dynamic competitive portfolio, the global solid waste management market share is bound to traverse a profitable path in the upcoming years. 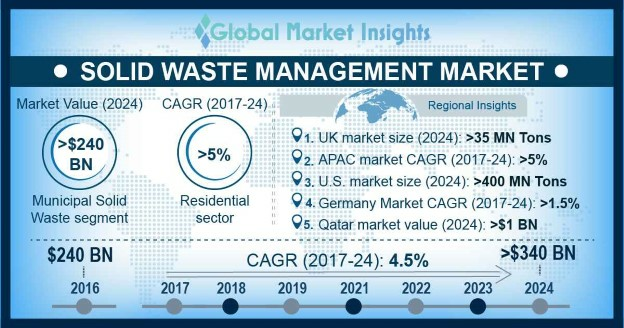 As per a research report compiled by Global Market Insights, Inc., solid waste management market size is forecast to surpass 340 billion by 2024. This entry was posted in Sustainable & Smart Technologies and tagged Anaerobic Digestion, Collection, Composting, Disposal, Industrial Solid Waste, Landfills, Municipal Solid Waste, Recycling, Solid Waste Management Industry, Solid Waste Management Industry Statistics, Solid Waste Management Market, Solid Waste Management Market Outlook, Solid Waste Management Market Overview, Solid Waste Management Market Size, WTE Incineration.